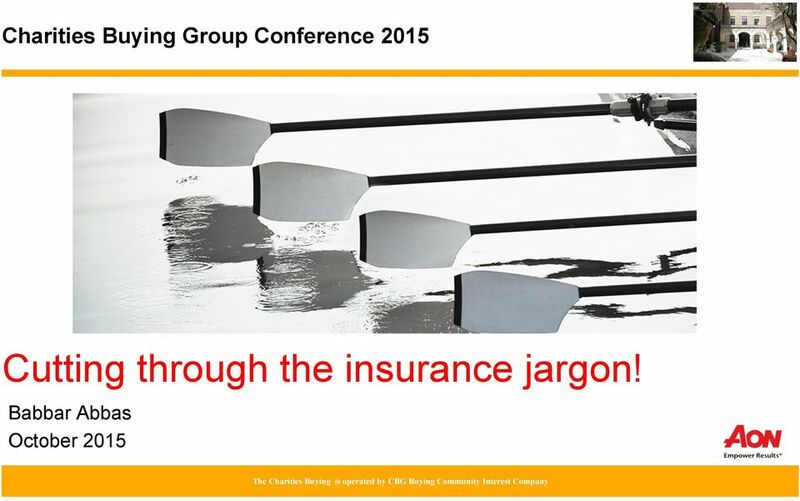 Download "Cutting through the insurance jargon!" 3 What I ll be discussing today What do I plan to talk to you about today? Making insurance simple. In particular the types of insurance, as a charity, you may need and why? 4 Business Interruption insurance What are the benefits of business interruption insurance? 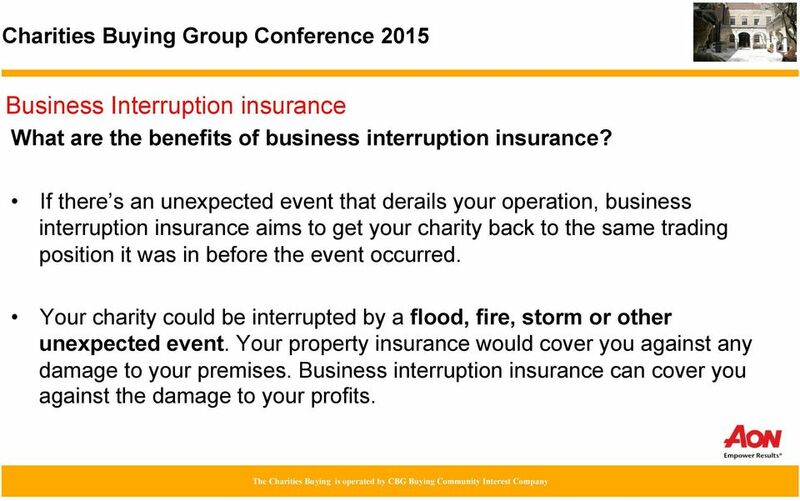 If there s an unexpected event that derails your operation, business interruption insurance aims to get your charity back to the same trading position it was in before the event occurred. Your charity could be interrupted by a flood, fire, storm or other unexpected event. Your property insurance would cover you against any damage to your premises. Business interruption insurance can cover you against the damage to your profits. 5 Business Interruption insurance continued Business interruption insurance can cover you against the temporary loss of revenue caused by your charity having to stop trading for a while. It could also cover any additional expenses involved in keeping your business going. For example, you might have to move to alternative premises or hire extra staff. 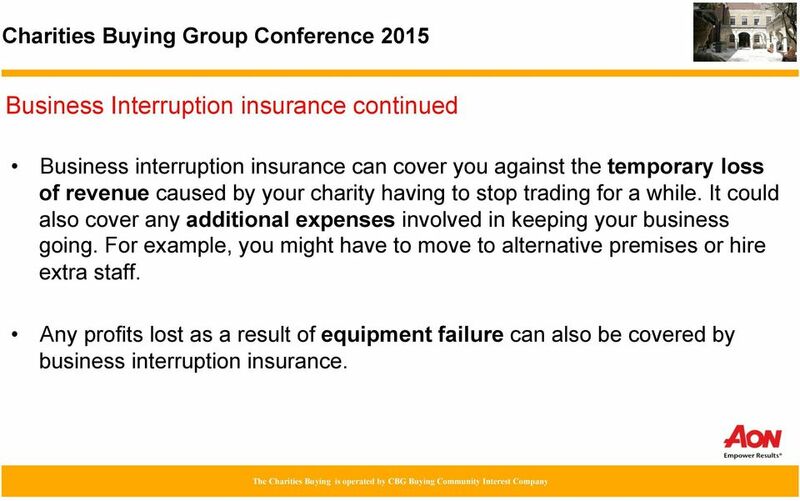 Any profits lost as a result of equipment failure can also be covered by business interruption insurance. 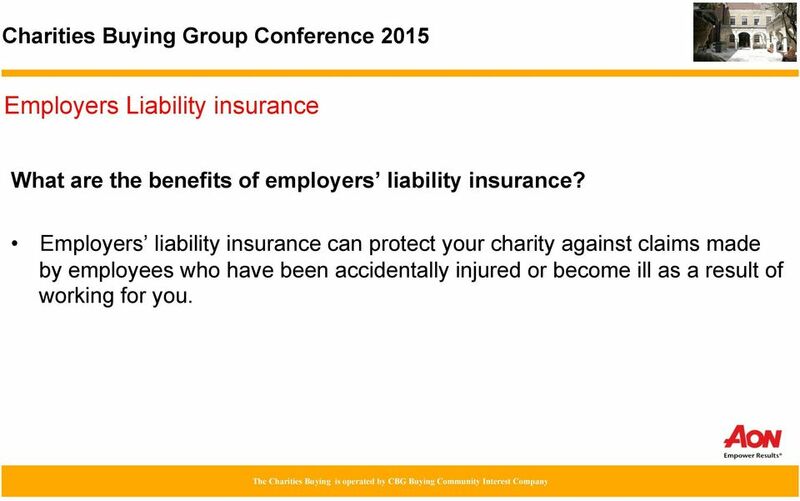 6 Employers Liability insurance What are the benefits of employers liability insurance? Employers liability insurance can protect your charity against claims made by employees who have been accidentally injured or become ill as a result of working for you. 7 Employers Liability insurance continued Easy access to no win no fee legal services only increases the likelihood that an employee will make a claim against you for an illness they say has been caused by work. 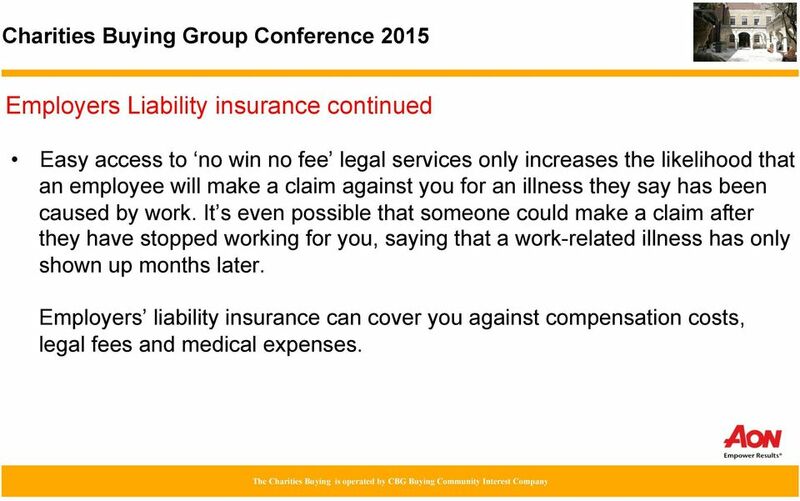 It s even possible that someone could make a claim after they have stopped working for you, saying that a work-related illness has only shown up months later. Employers liability insurance can cover you against compensation costs, legal fees and medical expenses. 8 Public Liability insurance What are the benefits of public liability insurance? 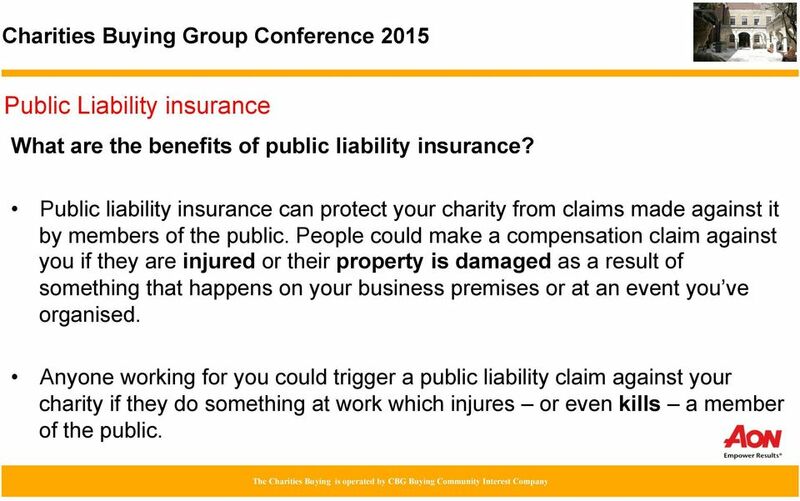 Public liability insurance can protect your charity from claims made against it by members of the public. People could make a compensation claim against you if they are injured or their property is damaged as a result of something that happens on your business premises or at an event you ve organised. Anyone working for you could trigger a public liability claim against your charity if they do something at work which injures or even kills a member of the public. 9 Public Liability insurance continued Public liability insurance can protect you against claims made by clients and contractors as well as members of the public. 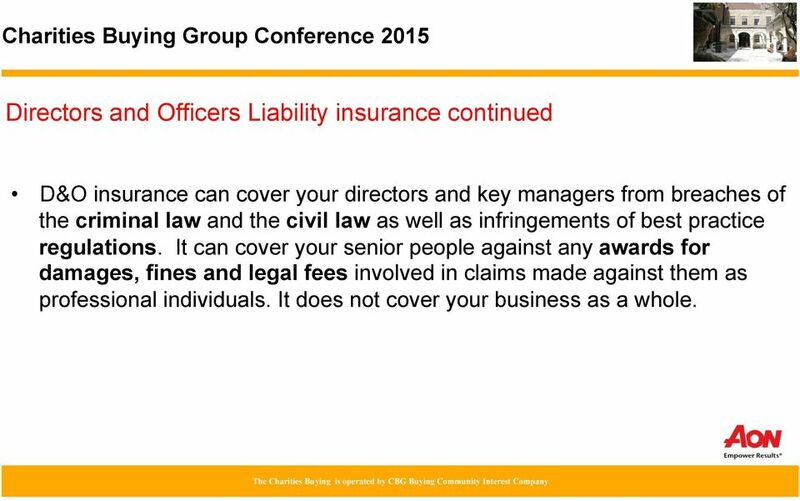 It doesn t protect you against claims made by employees for this, you would need employers liability insurance. Public liability insurance can cover your business against not just compensation payments but also legal fees and medical expenses. 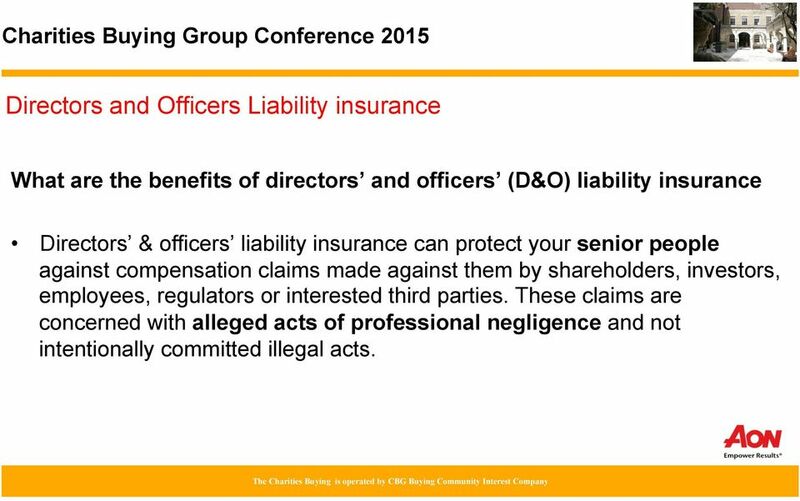 10 Directors and Officers Liability insurance What are the benefits of directors and officers (D&O) liability insurance Directors & officers liability insurance can protect your senior people against compensation claims made against them by shareholders, investors, employees, regulators or interested third parties. These claims are concerned with alleged acts of professional negligence and not intentionally committed illegal acts. 11 Directors and Officers Liability insurance continued D&O insurance can cover your directors and key managers from breaches of the criminal law and the civil law as well as infringements of best practice regulations. It can cover your senior people against any awards for damages, fines and legal fees involved in claims made against them as professional individuals. It does not cover your business as a whole. 12 And finally Cyber Liability insurance What are the benefits of cyber liability insurance? Cyber liability insurance can protect your charity against the financial losses caused by breaches of your network security, infringements of data protection laws, employee abuse of or libellous content on your website. These losses might be revenue losses or they might be fines. 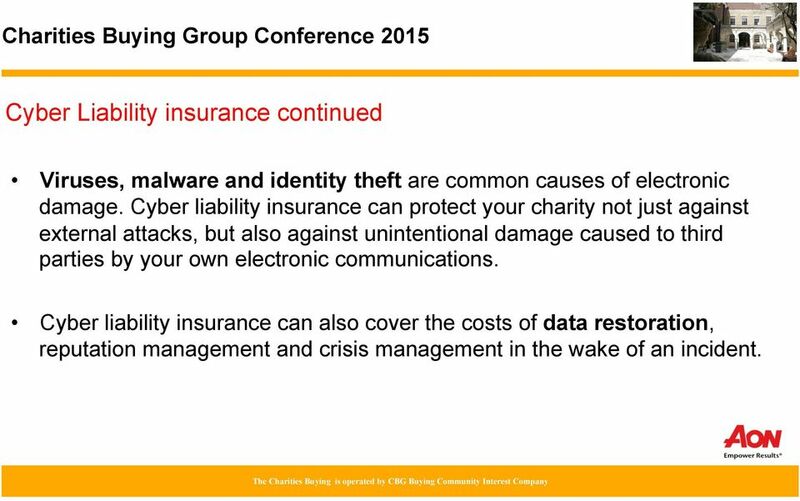 13 Cyber Liability insurance continued Viruses, malware and identity theft are common causes of electronic damage. Cyber liability insurance can protect your charity not just against external attacks, but also against unintentional damage caused to third parties by your own electronic communications. Cyber liability insurance can also cover the costs of data restoration, reputation management and crisis management in the wake of an incident. Managing risk. your essential guide to protecting your business. 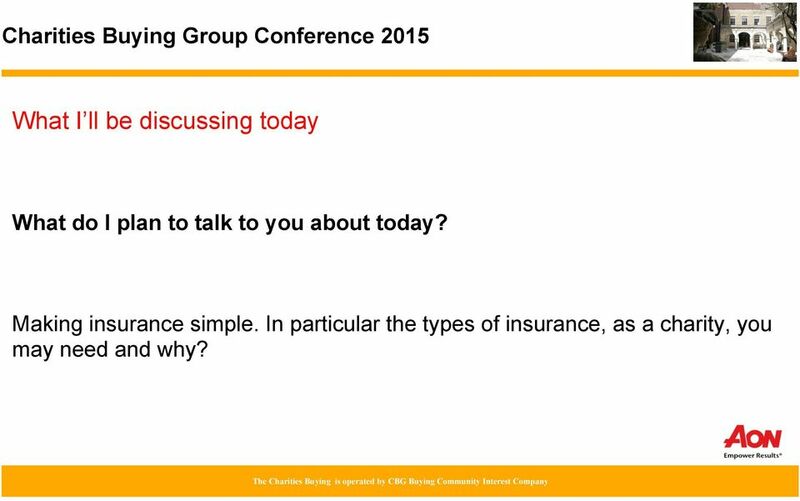 Making insurance simple Insight guide for non-profit organisations Contents 04 Introduction. 05 Compulsory insurance. 06 What types of insurance do you need? 07 Do you have employees? 08 Do you have volunteers? This section of the Guide sets out the LA s current mandatory minimum requirements, also recommended insurance and optional insurance. THE NATIONAL ASSOCIATION OF DECORATIVE & FINE ARTS SOCIETIES NADFAS HOUSE, 8 Guildford Street, London WC1N 1DA Tel: 020 7430 0730 Fax: 020 7242 0686 E-mail: enquiries@nadfas.org.uk Registered Charity No. The CFO s Guide to Document Retention: What Records to Keep and How Long? INSURANCE FOR VOLUNTARY ORGANIZATIONS ARE YOUR VOLUNTEERS AND CLIENTS COVERED? 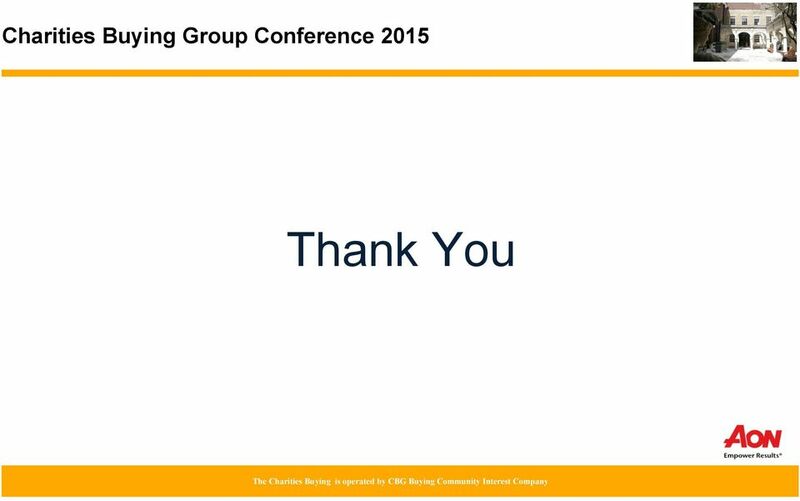 Gold Standard Insurance for NCS Trust Programme Deliverers What are the insurable risks to consider? Gold Standard Insurance for NCS Trust Programme Deliverers What are the insurable risks to consider? Working with large, diverse and growing numbers of young people, some of them could be quite vulnerable.